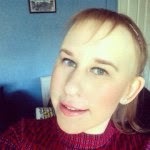 There is no denying Primark have invested a lot of money and time into their beauty section over the last year. I often visit their huge store in Manchester, and the aisles of beauty products seem to grow every time I go in. That obviously means that every time I go in I need to investigate any new items. There is no denying that they produce products so fast to keep up with trends just like their clothing, however I think their recent releases definitely got me thinking about the whole dupes/copying high end brands issue which is often talked about in the beauty industry. 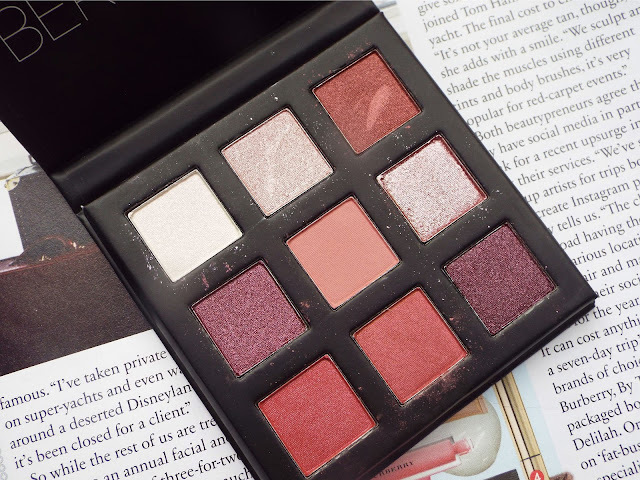 When I went into Primark at the start of August and was browsing the aisles of the makeup, my eyes were drawn to a small stand of eye palettes in quad shapes. I picked up berry velvets and I was instantly happy with the colour scheme within this quad. Hence the name, the shades are all themed around berry tones which are my favourites during the Autumn. I was drawn to these petite quad shaped palettes, as I had been longing after a Huda Beauty quad eyeshadow palette for the longest time. If you look at Huda's mauve obsession palette, you will be able to instantly see the resemblance between them. The 9 shades are definitely based around the same shade range, and also come with a mix of mattes and metallics. However, Huda's palette is £25 and the Primark version is £3. There was a sample quad which I was able to swatch and I was surprised at how pigmented they looked on first impressions. The problem with Primark makeup is consumers do not always use the swatch palette on the display to test the colours, meaning many of the products get ruined. I was glad to see that they have started coating their palettes with a plastic layer which needed to be cut off after being purchased. This was only £3 which I thought was an absolute bargain so I put it into my basket and headed on my merry way. I have been playing around with this Primark berry velvets palette for a few weeks now, and I am very happy to report that you need to run down to your local Primark and pick it up. I have tried and reviewed many Primark beauty products over the last year, but never any eyeshadows and I have to say they have done exceptionally well with this range. I do love buying high end eyeshadow palettes, I think Urban Decay's heat palette is my most used palette which I own. However, I am definitely not a beauty lover who only buys high end products, as I definitely buy more from high streets shops. I love finding products which are great high end alternatives for a fraction of the price. My favourite two shadows which I have been wearing together are sweetness (mid toned pink) with wild hearts (pink metallic) blended together. Devotion is a copper metallic and is such a beautiful and well pigmented shade. There are three shades which on swatch look a little bit chalky, they are peace (white pearlised), selfish (mid toned purple metallic) and tough love (dark plum mettalic). However, the two darker purple shades selfish and tough love look great when applied to the eye. Pearl is a little bit light for me as I love using this kind of shade for under my brow bone, and it does not quite give me the pop I wanted. Although, humble (light pink metallic) is perfect for this and has beautiful pigmentation. 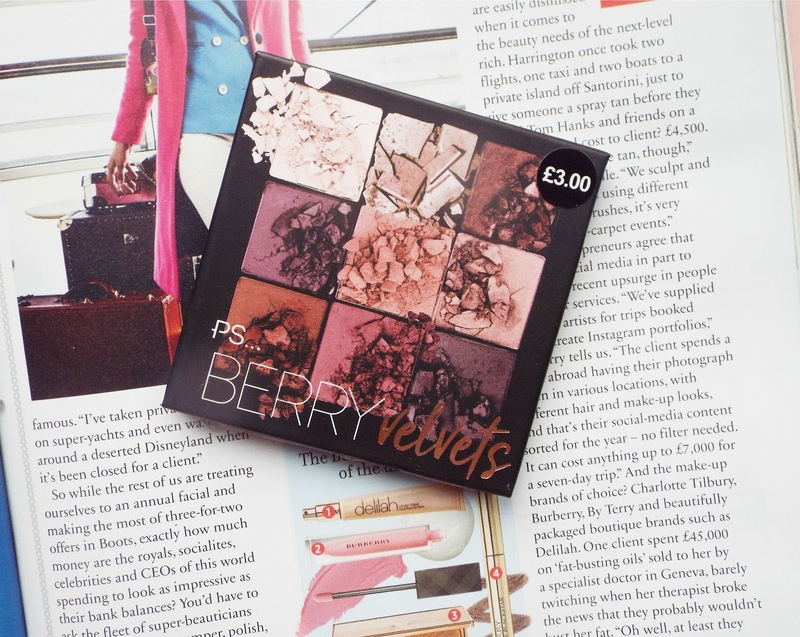 Overall, for £3 this is one of the best high street palettes which I have tried for a while. Normally, on the high street this palette would cost £8/9 at a minimum, so I am not quite sure how Primark has managed to produce such a good quality palette for such a small price. The packaging is card and the corners will probably start to ruin after a few uses, but I have noticed a lot of palettes are now coming in card packaging. I think that this will be a brilliant palette to travel with as it is so dinky and portable. 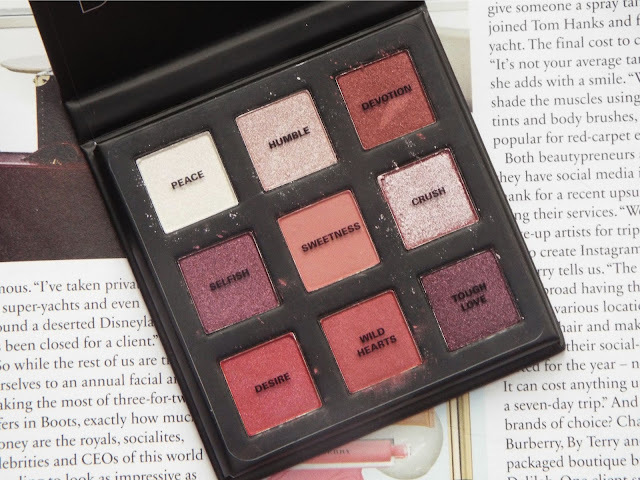 I am very impressed with this and there was two other palettes in this range, one had smokey brown tones and the other was bright and vibrant. I will definitely be looking out for them on my future visits to pick up and try.